It is now a well-know fact that mergers and acquisitions activity comes in waves. The most recent wave, the 5th takeover wave of the 1990s, was characterized by an unprecedented number of corporate restructurings in terms of mergers and acquisitions (M&As), public-to-private transactions, spin-offs and divestitures, and leveraged recapitalizations. Following the collapse of the stock market in March 2000, M&A activity slumped dramatically, but this pause ended in the second half of 2004 when takeover deals occurred again quite frequently. Indeed, some observers wonder whether the 6th takeover wave has started. The takeover wave in the 1990s was particularly remarkable in terms of size and geographical dispersion. For the first time, Continental European firms were as eager to participate as their US and UK counterparts, and M&A activity in Europe hit levels similar to those experienced in the US. Due to its financial impact and the unprecedented activity in Continental Europe, the 5th takeover wave of the 1990s and recent takeover activity (in biotech, utilities, pharmaceuticals) have triggered a great deal of interesting academic research. This volume brings together a selection of insightful papers. 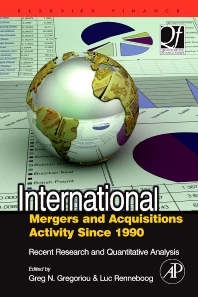 An impressive group of international authors address the following themes: takeover regulation; the cyclical pattern of the M&A markets and probable causes and effects; methods to determine the performance of success of M&A actions; cross border deals; means of payment and its effects; studies of hostile bids; high leverage takeovers and delistings.